Fig. 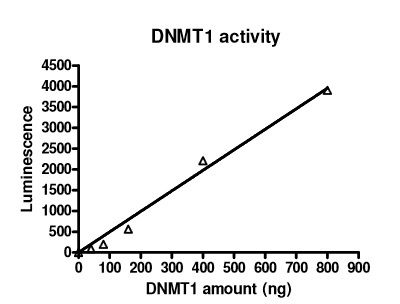 1: Example of a DNA methyltransferase assay: DNMT1 enzyme activity, measured using the DNMT1 Assay Kit. Methylation of DNA plays a crucial role in transcriptional regulation, imprinting, and chromatin structure. DNA methyltransferases add a methyl group to cytosine or adenine DNA nucleotides. DNA methylation is a dynamic and reversible process and alters the expression of genes during cell division and differentiation from embryonic stem cells to specific tissues. The process is usually permanent, preventing cells e.g. from re-differentiation. During zygote formation, methyl groups are removed and subsequently re-established during development. The reducing effect of gene expression is mediated by methylation at the 5 position of cytosine and it is present on all vertebrates. In adult somatic cells methylation is seen in a CgG context, while non-CpG methylation is current in embryogenic stem cells. Enzymes that catalyze DNA methylation are well characterized and already used as target enzymes for drug discovery screenings. BPS Biosciences offers a range of active DNA methyltransferases and DNA methyltransferase assays for inhibitor screenings (see Fig.1). The knowledge about DNA de-methylation and the player involved in this process has been poor for quite some time. Generally it can be distinguished between global, genome wide and locus-specific demethylation events. A typical example for global demethylation is implemented in zygote formation as already mentioned above, locus-specific DNA demethylation occurs for instance in genomic imprinting during plant reproduction. It has been proposed that the conversion of of the modified base 5-methylcytosine (5mC) into 5-hydroxymethylcytosine (5hmC) is the initial step of active demethylation of DNA in mammals and that TET1 (Methylcytosine dioxygenase 1) is the enzyme catalyzing this reaction and further oxidation of 5hmC to generate 5-formylcytosine (5fC) and 5-carboxylcytosine (5caC) (1, 2, 3). Thus it has been suggested that TET1 can be considered as the first DNA demethylase described so far. Fig. 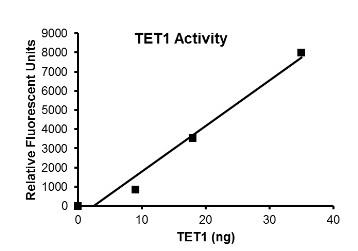 2: TET1 enzyme was combined with a TET methylated-substrate in assay buffer for 90 minutes. A fluorescent-conjugated antibody that recognizes hydroxy-methylated product was added and fluorescence was read at excitation 530 nm and emission 590 nm. To facilitate activities further investigating the role of TET1, especially in developmental biology and epigenetic transcriptional regulation – and as a potential drug target, BPS Biosciences recently launched an active form of the TET1 enzyme. The protein has been expressed in insect cells and tested in a biochemical assay as shown in Fig. 2. Interested in TET1? Or in DNA Methyltransferases and related assays? Leave your questions and comments below!